Scott Dinsmore, 47, and David Russell, 52, keep busy running their Spanish colonial-style boutique hotel, El Castillo, on Costa Rica’s southern Pacific coast. It sits 600 feet above the beach in the jungle-clad mountains that rise sharply from the deep blue waters. But they never forget to enjoy the natural beauty of their adopted home. Daytime getaways to one of the many untamed and nearly deserted local beaches are a favorite. Steamy tropical jungle runs right to the sand in this region. There are no large resorts, no highrises—hardly any beachfront development at all. The shoreline is in its natural state, unspoiled. They also frequent the many local expat-owned gourmet restaurants in the nearby town of Ojochal. There’s Italian, Indonesian, French, and, of course, Costa Rican fare to choose from. David, a culinary school graduate, runs his own place, Azul, which is Mediterranean-themed. And, of course, they never miss a happy hour with their guests. 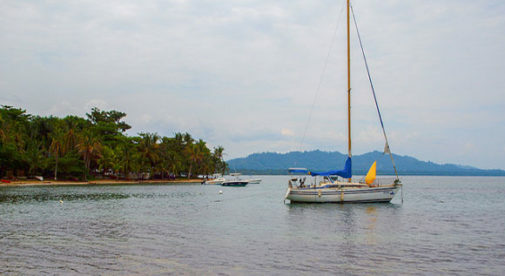 It’s the perfect location: a large terrace overlooking the Pacific and a small island, called Caño. An infinity pool is ready for those who want to take a dip while taking in the view. Over on the Caribbean coast, Tom Keller and Zoe Courtier had the same idea. They opened Geckoes Lodge, made up of two luxury vacation rental homes. It’s high-end, with a relaxed vibe, and a favorite for honeymooners. The homes are set well off the main road, just south of the town of Puerto Viejo. It’s quiet and peaceful, with plenty of wildlife, such as sloths, monkeys, and toucans in the surrounding jungle. Typical of the Caribbean coast, the homes have open air living areas with fans to keep the air circulating. Air conditioning is rare here—long-time residents say it’s just not needed. The couple decided against a hotel when mulling over what type of lodging business to open. (Too much work.) With their current setup, there are only ever two sets of guests at a time. Often they have a neighborly relationship, sharing dinner, drinks, and conversation in their own home, which is also on property. David and Scott and Tom and Zoe are typical of many innkeepers in Costa Rica. They’re making a living, sometimes a great living. But their main motivation is the lifestyle. They get the chance to live in a beautiful, tropical locale and provide guests with the time of their lives.